DisplayPort is a next-generation technology that delivers high bandwidth, pure digital audio video signals from your PC to your display. 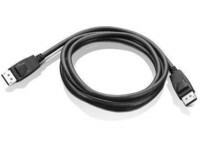 Lenovo DisplayPort to DisplayPort Cable conforms to DisplayPort 1.2 specification, and offers a royalty free full digital audio video support in the same cable. Supporting a maximum bandwidth of 21.6 Gbps, Lenovo DisplayPort to DisplayPort Cable enables support for next generation multimedia applications with superior fidelity and 3D support, higher resolution of up to 4K x 2K displays and daisy chaining and multiple monitor support over a single connector.